Fly through the rainforest, over the Orquideas River and right into a tequila bar and restaurant. Take a wild ride on Puerto Vallarta‘s popular first-ever zipline circuit, which boasts more than two miles (3 km) of cables strung 328 feet (100 meters) above the ground. Enjoy free time for lunch, cocktails and swimming, or play with monkeys and marmosets in the on-site wildlife menagerie. Board your air-conditioned minivan or open-air vehicle at a central location in Puerto Vallarta and take a 30-minute drive into the lush jungle near the Orquideas River. 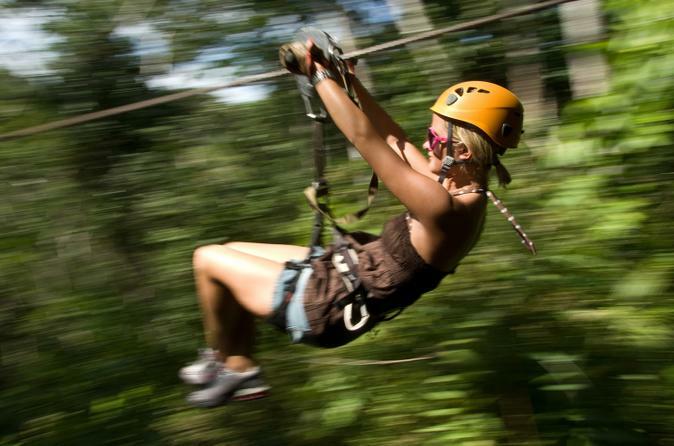 The challenge course you’re about to tackle is Puerto Vallarta’s original zipline circuit, and has since consistently been ranked by TripAdvisor reviewers as one of the region’s top outdoor activities. During your orientation upon arrival, expert instructors explain the layout of the course and show you the top-of-the-line gear used, including an easy-to-use braking system. When you’re ready, head up to the first platform, clip on and jump off! Your aerial journey includes more than two miles of cable in a series of 15 ziplines, including four courses more than 1,450 feet long, set up more than 328 feet above the rainforest floor. Fly across the Orquideas River and through the treetops for breathtaking bird’s-eye views. You’ll hike between some of the platforms, giving you a chance to capture more vivid jungle landscapes from the ground up. As you work your way through the circuit, guides are present to ensure your safety and answer questions you may have regarding the plant and wildlife you see along the way. For the final zipline, with cables for two people, grab a partner and race to the finish — see which one of you lands first, right inside the riverside tequila bar and restaurant. Cap off your day with a tequila tasting, delicious lunch or mango margarita (own expense). Afterward, cool off in the river or check out the on-site wildlife menagerie of squirrel monkeys, marmosets, coatimundi, spiders and boas. Action shots of your zipline adventure are available for purchase before taking transport back to the starting point.